Suburban area — primarily a place of relaxation where you can escape from urban problems. So to arrange it so that every element is pleasing to the eye, creating a sense of peace and harmony. Water bodies in this situation are playing not the last role. Pond, small waterfall or fountain will decorate your cottage will be a place where you can sit in silence. The construction of the fountainand start with the choice of location. It is better to do before the start of construction of the villas when you are planning where and what you will be. Think about where you can arrange recreation area. It should not interfere with economic activities. The platform should be large enough to be able to dig a hole. Nearby water pipes will greatly simplify the process. The water may go down the drain, but there is a fountain with recirculation. The latter option is preferable if you pay for water by the meter. Think about the design. It is best to draw what you want. The plan may change and updated in the process, but it needs to be. It is possible to arrange, for example, a fountain in the form of a spring. Then you will need different stones that you put inside the Cup and around the edges. Between the rocks you can plant moisture-loving plants. If you prefer rustic style, put about a Cup something like a miniature water mill. Instead you can use pottery. For example, a spring may flow from a broken ceramic pot. In agricultural stores for a large assortment of bowls and pumps. These two elements are closely related to each other, and the capacity depends on the capacity of the pump, which can range from 1.5-2 liters per hour to 150. 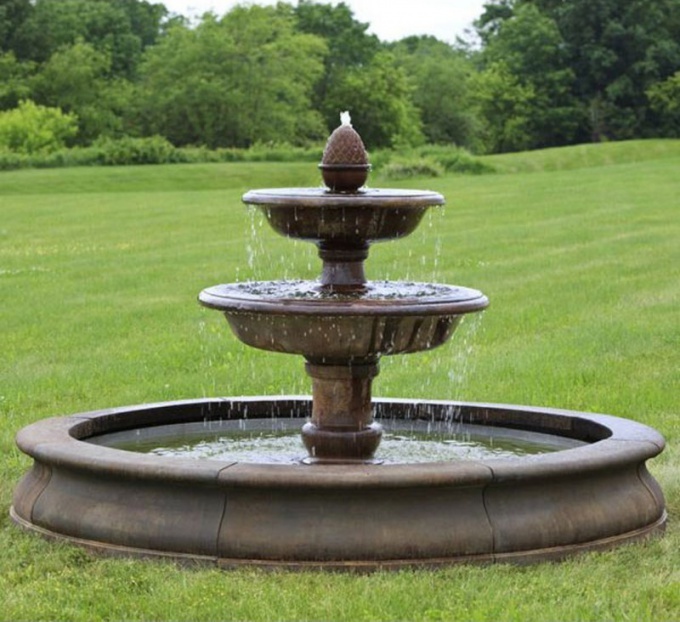 A small fountain will require a minimum of drainage, which must also be considered. Dig a hole that size, so you can put it in the bowl, Determine the position of the pump. If the bowls are not, it is necessary to strengthen the walls of brick about the same as for a pool. Will need waterproofing. This is a special film which also to buy agricultural or hardware store. The bottom of the fountainand fill with sand. .You may need to connect the drain to the sewer. Yourself you are unlikely to be able to do it, it is better to call specialists from the construction organization or public utilities. Install the pump. The large fountainand it is located above the water level, the smallest — on the contrary. Before you begin to build your creation, control height of the jet and pressure. Decorate the fountain. On the sides of the bowl can be put figurines of animals or fairy tale characters. That the pump is not evident, it is possible to collect stones. Next to the bowl put moisture-loving plants. You can even do something like a spring in rock gardens. In this case, the seat should be high enough to be able to make a fountain in the form of hill stones. A very small fountain can be done without the pump. It successfully replaced the aquarium pump. Find the right-sized dishes. It should be quite high. Quite suitable, for example, the fishbowl. Make a hole to insert a hose. The hose connect to the pump. What you have got, put it in a container. Pump cover with pebbles or expanded clay. Cut a piece of plastic film of a size that could completely cover the layer of pebbles. Do it in the hole and route the hose. On top of the film, place stones, decorative ground and other design elements. Do you need another sink and a stand for it. The stand can be glued, for example, of stones. It can be in the form of a vase with a perforated bottom. The hole needs to pass the hose. On the stand, if necessary, install the sink. It should also be a hole. Hose end output, but so that it was not very noticeable. Finish the design of the fountain. In the decor you can use seashells, pretty stones, all kinds of statues. They are best glued with waterproof glue. Fill the bowl to the pump was under water and the ground was a something like a small islet. Turn on the pump in the socket. This fountain can be done not only to give, but also for urban apartment. Next to the fountain should not be plants that suffer from high humidity. In country recirculating fountain, as in a small room, the water must from time to time to pour.